Career management is a lifelong process. It means creating goals for your work and personal life. It also means working towards your goals. It is more than just what you do to find a job. Why should you manage your career? The job market is not the same as it used to be. Today's economy is global. This impacts what employers want from workers. The types of work and training that you can pick have also changed. How do you manage your career? 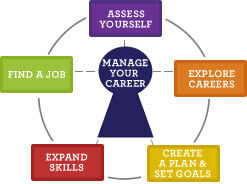 Manage Your Career is at the center of the career-planning model. 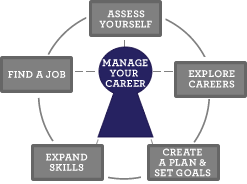 The other steps in this model help you know how to manage your career. You learn to flow with the changes that occur in your work. You commit to lifelong learning. Every now and then you think about your skills and interests. You have a “can do” attitude. You take charge of your career. Learn how to use this guide. Look at The New World of Work to see what job seekers and employees face today. Know what your work skills are.